The Waterkeeper Alliance today announced results of four samples from the Neuse River showing high levels of arsenic in surface water near Duke Energy’s HF Lee plant. The samples were collected on Sept. 19 from areas near the utility’s inactive coal ash basins, which were flooded during Hurricane Florence. According to Upper Neuse Riverkeeper Matthew Starr, who boated to the basins, he collected four samples — three water and one soil — upstream of the City of Goldsboro’s water supply intake. The arsenic concentrations were all above the 10 parts per million maximum allowable concentration for drinking water supplies, peaking at 186 ppm. Levels of strontium ranged from 22.3 to 1,300 ppt. There is no federal drinking water standard for strontium. Currently EPA uses a one-day health advisory level of 25 ppm. Vanadium concentrations peaked at 102 ppm. The EPA has not set a standard for the chemical in drinking water. The testing detected hexavalent chromium in only one sample, at 0.58 ppm. The NC Department of Environmental Quality has conducted its own sampling, but those results have yet to be released. Those regarding the Lee plant are expected this afternoon, according to a DEQ spokesperson. Duke Energy released results of its testing, conducted Sept. 18 through 22, that indicated arsenic levels peaking at only 1.7 ppm. 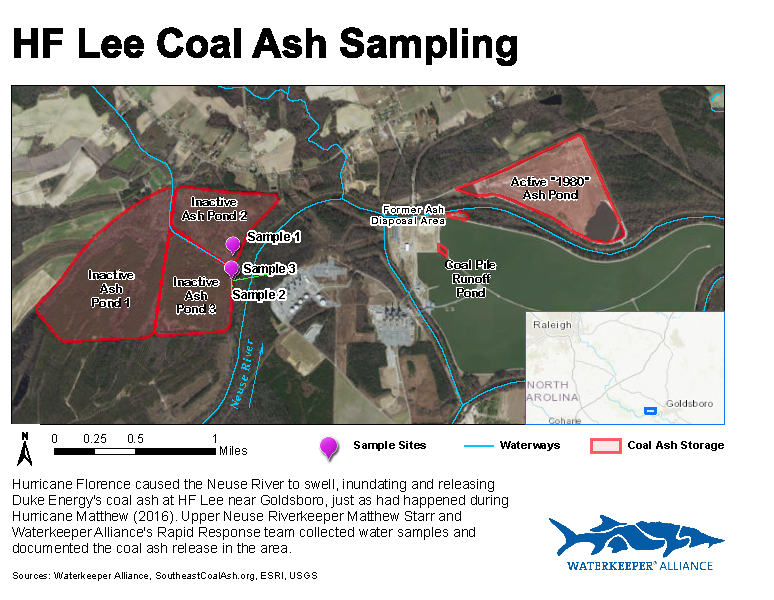 However, these samples were not taken at the inactive coal ash basins, but rather both upstream and downstream of the plant, the latter being at Stevens Mill bridge down from the cooling pond. Culbert said the waterkeepers “likely tested cenospheres,” hollow balls of coal ash byproducts that contain aluminum, silica, arsenic and lead. Starr said he did not collect cenospheres and the highest levels of arsenic were in water. Environmental advocates and community members have demanded that Duke excavate all of its ash basins. However, the utility plans to cap the ash in lined landfills onsite at five plants: Belews Creek, Cliffside, Roxboro, Mayo and Marshall. Earlier this week, two university scientists criticized Duke’s sampling in a story published in The News & Observer,stating that testing river sediment would reveal a more accurate extent of contamination. As the utility did after Hurricane Matthew two years ago, it will monitor water quality both in the Cape Fear and the Neuse for at least several months.